The Project ID and Project Description at the top of this page provide information to the Project Manager about this specific project. The tabs below that show the phases of this project. The Project Manager can easily navigate from one phase of the project to another by clicking on the different tabs. The tab for Phase 1 is currently selected in the screen capture. The middle and lower portions of the screen show the deliverables in Phase 1. The Status column indicates whether work has been done or is still ongoing for each deliverable. 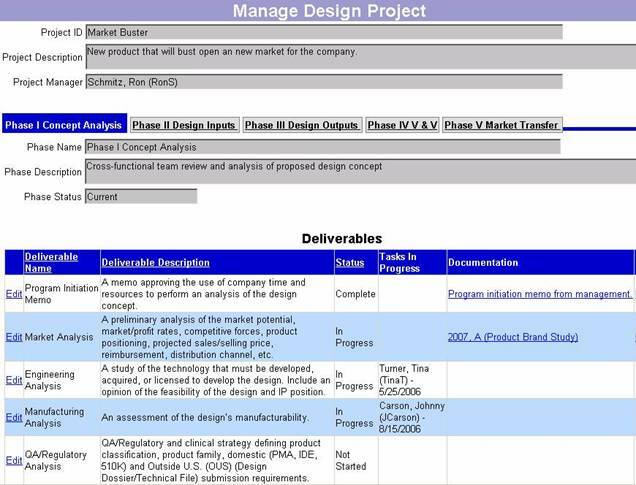 Documentation that has been uploaded for a deliverable is shown on the right side of the screen in the Deliverables table.